I am an historian of the medieval eastern Mediterranean, specializing in the society and culture of the eastern Roman Empire (the Byzantine Empire) in the ninth through twelfth centuries. I have strong interests in the late antique and classical antecedents of the medieval eastern Mediterranean cultures. Within Byzantine history, my particular research interests include: gender, civic religion and religious aspects of political culture, and historical memory and historiography. Leonora Neville. 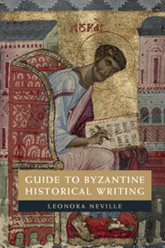 Guide to Byzantine Historical Writing. Cambridge University Press, 2018. Leonora Neville. Anna Komnene: The Life and Work of a Medieval Historian. Oxford University Press, 2016. Leonora Neville. 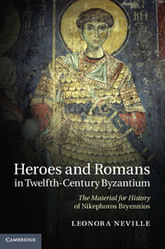 Heroes and Romans in Twelfth-Century Byzantium: The Material for History of Nikephoros Bryennios. Cambridge University Press, 2012. Leonora Neville, Leonora Neville. 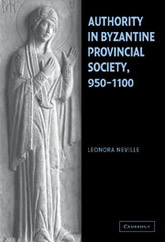 Authority in Byzantine Provincial Society, 950–1100. Cambridge University Press, 2004. “The Rise and Fall of the Byzantine Empire,” TED-ed video, April 9, 2018. “Anna Komnene, the Princess Historian,” Episode 73 of Historically Thinking podcast series by Al Zambone, Department of History, Augustana College, December 2, 2016. Byzantine Gender, under contract with Arc Medieval Press, Past Imperfect series. “Why the Byzantines Wrote History” In Proceedings of the 23rd International Congress of Byzantine Studies: Plenary Papers, Edited by Smilja Marjaović-Dušanić, Serbian National Committee of the Association Internationale des Études Byzantines, 2016, 265-276. “The Adventures of a Provincial Female Founder: Glykeria and the Rhetoric of Female Weakness” In Wiener Jahrbuch für Kunstgeschichte 60, edited by Margaret Mullett, Michael Grünbart and Lioba Theis, 2014, 153-162. “Lamentation, History, and Female Authorship in Anna Komnene’s Alexiad,” Greek, Roman, and Byzantine Studies 53.1, (2013): 192–218. “Organic Local Government and Village Authority.” In Authority in Byzantium, ed. Pamela Armstrong, Ashgate, 2013, 285-295. “Strong Women and their Husbands in Byzantine Historiography.” In The Byzantine World, ed. Paul Stephenson, Routledge, 2010, 72-82. “A history of Caesar John Doukas in Nikephoros Bryennios’s Material for History?” In Byzantine and Modern Greek Studies 32.2 (2008) 168-188. “Taxing Sophronia’s Son-in-Law: Representations of Women in Provincial Documents.” In Women in Byzantium: Varieties of Experience, 800-1200, ed. Lynda Garland, Aldershot: Ashgate, 2006, 75-87. “Information, ceremony and power in Byzantine fiscal registers: varieties of function in the Cadaster of Thebes,” Byzantine and Modern Greek Studies 25 (2001): 20-43. 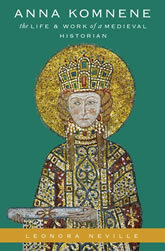 Co-Winner of the Prize in Memory of Nikolaos Panagiotakis, 2007 edition, for the essay “Power-Hungry Byzantine Empresses and Theodora’s Rhetorical Legacy: the functions of women in Byzantine historical narrative” given by the Università Ca’Foscari in Venice and the Greek Ministry of Culture.